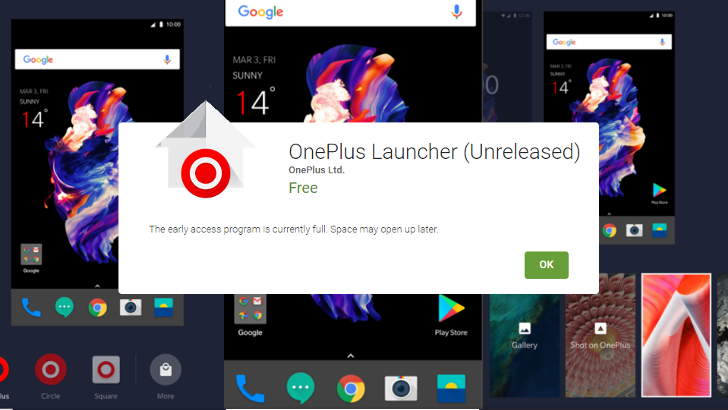 It looks like OnePlus might be looking for a faster and easier way to update its launcher instead of waiting on OTAs to deliver updates. As of today, the OnePlus Launcher is appearing on Google Play. Unfortunately for anyone clamoring to check it out, it's currently in limited beta, and all the test slots are full. OnePlus isn't the only manufacturer to have resorted to using the Google Play Store as a means of delivering updates. Samsung has also been moving apps over to the system, and it's a good move. It is much easier for users to keep their applications up to date when they are all being delivered in the same way. Since OnePlus was previously providing app updates via the more labor-intensive method of OTAs, this might mean that more frequent changes are in store for the OnePlus Launcher. But, since the current changelog only mentions improved performance and bug fixes, we'll have to wait and see. Although most of us can't download it just yet, if you are curious, you can check the app out over at the Play Store below. It looks like someone at OnePlus might have been a bit too fast for the rest of the company. As quickly and silently as the listing came, so has it departed. The page for the app is no longer functioning. We can't be sure why it was taken down, but the fact that it was in a closed early access program might have something to do with it. We'll have to wait and see if it returns any time soon.